Every day, more and more concerned pet parents are discovering the amazing difference a raw diet can make. Even so, the leap from kibble or canned to raw can be intimidating. Freeze-dried alternatives, like Sojos, combine the affordability and shelf-stable convenience of kibble—with the superior nutrition of raw. The transition from kibble to a raw diet should proceed slowly over 7 - 10 days to avoid upsetting your pet's digestive system. Transitioning may take longer for older, sick or finicky pets. 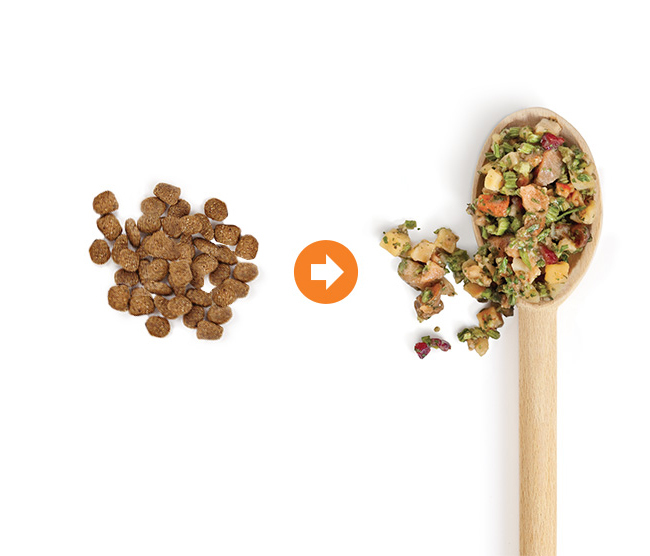 To transition, begin with a pinch of rehydrated Sojos added to your pet’s dish, and gradually increase the Sojos serving each day, as you decrease the other food. Enzymes found in fresh, raw foods not only play an important role in digestion but support your pet's overall well-being. Enzymes allow your animal's body to absorb essential nutrients he wouldn't otherwise benefit from. And because his body is able to utilize those nutrients, his immune system is stronger. All the fruits, veggies, grains and meat in Sojos mixes are raw, meaning those crucial enzymes are intact and your pet will benefit. A shiny, soft and full coat is a telltale sign of a healthy pet. Enzymes in raw dog food help protect your pet's teeth and gums. A healthy immune system is your pet's best defense against allergies. Diet and exercise are essential to maintaining your pet's healthy weight. Caviar loves Sojos Wild Salmon.